Pacific Mazda | What is CVT ? Real Drivers don’t drive a CVT…at least not quite yet. Congratulations! Your brand new car has a sophisticated motor that provides, power, economy, and reliability. It also has a brilliantly engineered chassis that provides traction in all conceivable driving conditions, along with a comfortable ride. All that’s missing is a way to deliver power to the driven wheels. When operating, an engine produces torque, explained in the simplest terms as a “twisting action.” Imagine a wrench connected to a nut or a bolt. Pulling or pushing on the handle of the wrench produces torque that will loosen or tighten the nut or bolt. The torque produced by an engine provides the turning force that turns the drive wheels of your car. By placing a transmission or gearbox between the engine and drive wheels, it becomes possible to take full advantage of the power produced, while enhancing fuel economy. Whether manually selected, or accomplished automatically, the ability to change gears makes it possible to select the ratio that best meets prevailing driving conditions. A manual transmission is the simplest option, and requires the driver to physically move a lever to change gears. An automatic transmission performs this task for the driver. There are a number of variations on this theme, with the Continually Variable Transmission (CVT) beginning to find favour with some manufacturers. CVT technology was first considered by the British car manufacturer Clyno in the early part of the last century. Clever as it was, the CVT didn’t enjoy mainstream success until the Dutch manufacturer DAF (Doorne Automoniel Fabrik) introduced it in their small passenger car in 1958. Despite having proven the technology, the CVT once again returned to obscurity until Subaru unveiled their Justy in 1987. Nissan has been among the first of contemporary manufacturers to embrace the CVT, re-introducing it back into the marketplace in their 2003 Murano crossover. Convinced that the CVT offers distinct advantages, Nissan has subsequently used the CVT across their range of vehicles. Whether a manual or automatic gearbox, there are usually five, six or more forward gears, along with a reverse. A CVT differs in that it operates without the use of conventional gears. Anyone who has owned a bicycle will understand the basic principle of the CVT. Imagine that instead of having a chain connected to an 11-speed rear cog set, you have instead a belt drive and a cone-shaped rear cog. To change ratios with the traditional chain and cog set, the derailleur moves the chain to a specifically selected gear. Using the belt and cone-shaped rear cog system (CVT) the belt moves along the cone until it finds the perfect place to transfer the power being applied. In a CVT the ratio best suited to load and speed is determined through advanced electronics. A CVT offers a fuel saving advantage over a traditional automatic transmission. By allowing an almost infinite range of gearing, the CVT is better able to operate in its optimum power range. 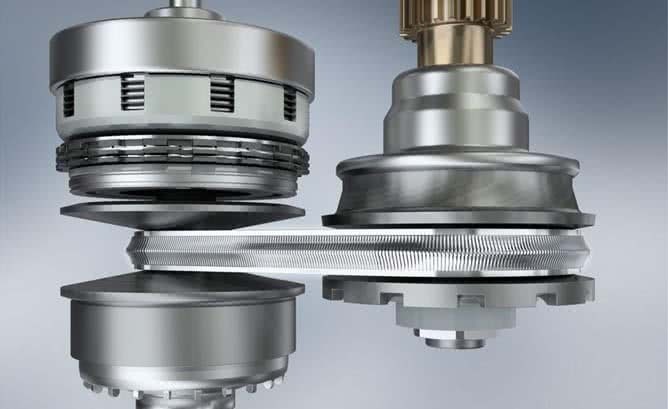 Smoothness is perhaps the greatest advantage attributed to the CVT, as it provides step-less acceleration, rather than shifting through a given number of gears. Driving a vehicle with a CVT is an experience many drivers don’t initially enjoy. Unlike the traditional transmission that provides a rise and fall in engine note in step with gear changes, the CVT may give the impression the transmission is slipping — a sensation much like driving a car with a worn clutch. While familiarity with a CVT overcomes some initial disappointment, this type of transmission is frequently described by those who enjoy driving as being uninvolving. Why are driving enthusiasts reluctant to embrace the CVT? CVTs are unable to provide the degree of performance expected by driving enthusiasts. Uninvolving isn’t synonymous with driving enjoyment. A few manufacturers have made an effort to bring back the feel of a conventional transmission through clever computer programming, but the reality is that the CVT is unable to respond quickly enough to satisfy performance expectations. While the contemporary CVT now has some years of development and service behind it, the fact remains that it still isn’t as reliable as the traditional automatic transmission. Whether the outstanding Mazda3, the recently lauded CX-9, or the new MX-5, Mazda builds cars that reflect their “Driving Matters” mantra. Building on the successful Zoom Zoom campaign, Mazda strives to provide owners with an engaging and exciting driving experience. The foundation of this commitment to the joy of driving is Mazda’s SKYACTIV technologies which cleverly combine driving performance with exceptional fuel economy. Mazda has developed two new SKYACTIV transmissions — a 6-speed SKYACTIV-manual transmission, and an automatic designed to provide a driving experience as involving as the manual. The SKYACTIV transmissions are designed to work in harmony with the rest of the car, and to enhance the performance and handling characteristics of the vehicle.